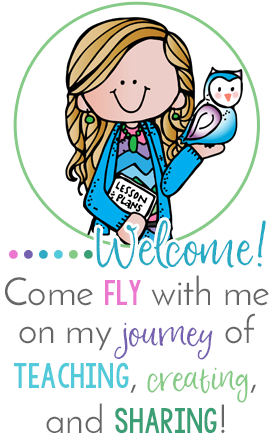 This has been a whirlwind of a year! There have been a lot of changes in my district, but I finally feel like I'm getting a handle on second grade curriculum, my schedule, and balancing it all along with family life. We are getting ready for the end of first trimester and testing, and I'm reviewing concepts using thematic centers and workstations. This year my team and I have decided to do more thematic teaching than we have in the past. A colleague attended a science workshop that encouraged teachers to teach thematically. (Of course when I heard that, it reminded me of how I used to teach two decades ago when I first started!) I was very excited to hear her say that! I love that we can integrate reading, writing, math, science, and social studies into our day without feeling like we "can't do it all". The students are so much more engaged when we teach in a meaningful way that is relevant to them. We are off for Fall Break this coming week, but when we return, we will finish up bats and begin spiders, and the last week of October will be Pumpkin Week! 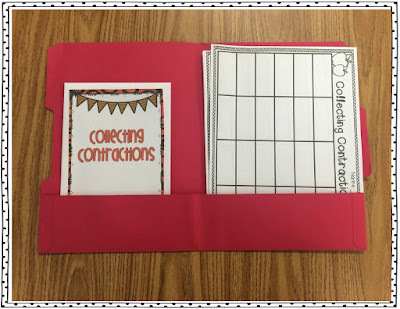 Something that has been so helpful to my thematic planning is Pawsitively Teaching's Pawsitive Planner posts. 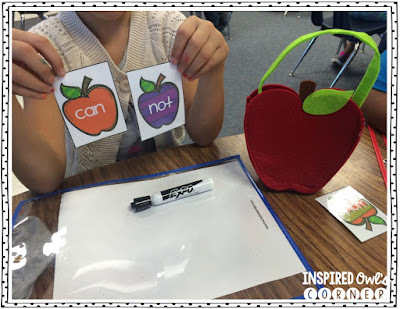 I have been spreading the word about them because they are so helpful to teachers! 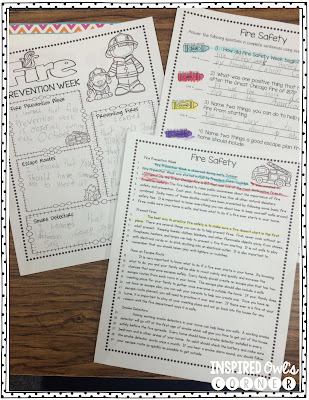 Pawsitively Teaching has tons of great ideas and has done all of the planning for us! 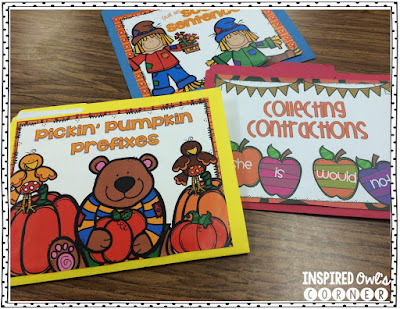 These posts included thematic book, video, and teaching ideas. 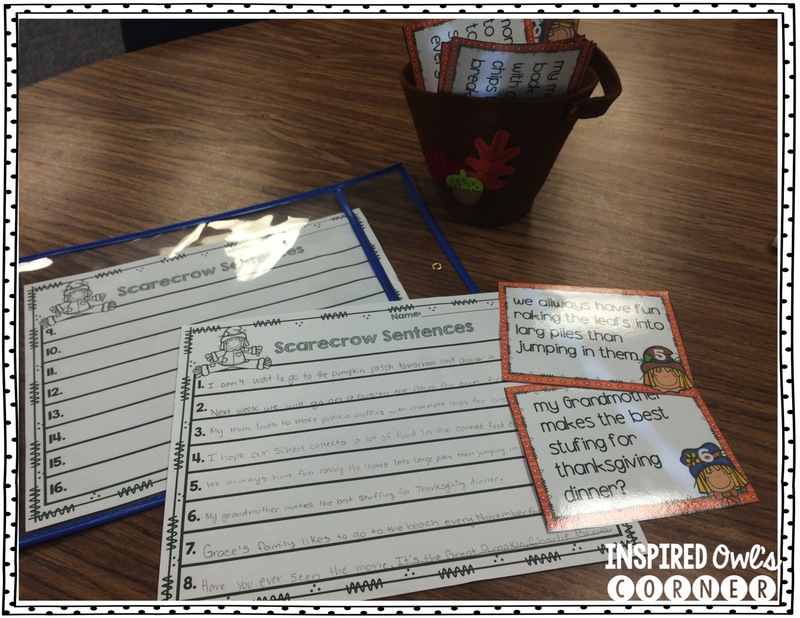 Check out these posts: Christopher Columbus, Fire Safety, and Pumpkins. She is working on Spiders as we speak! I have struggled with organizing my centers/workstations for years. 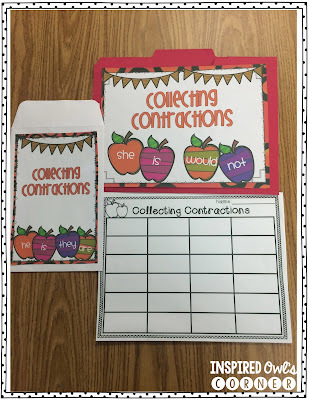 There are so many task cards, recording sheets, and answer keys to keep track of! 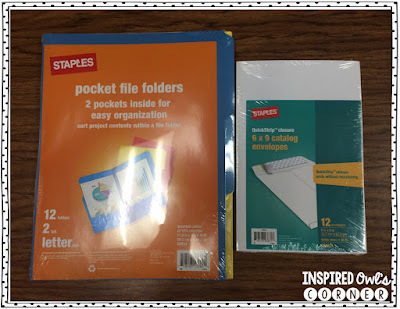 I have tried gallon-sized Zip-Lock bags, large envelopes, and 12 x 12 plastic bins used for scrapbook paper and supplies. You name it, I have probably tried it! Nothing seemed to work well, until I found a system last year for organizing and storing these files. 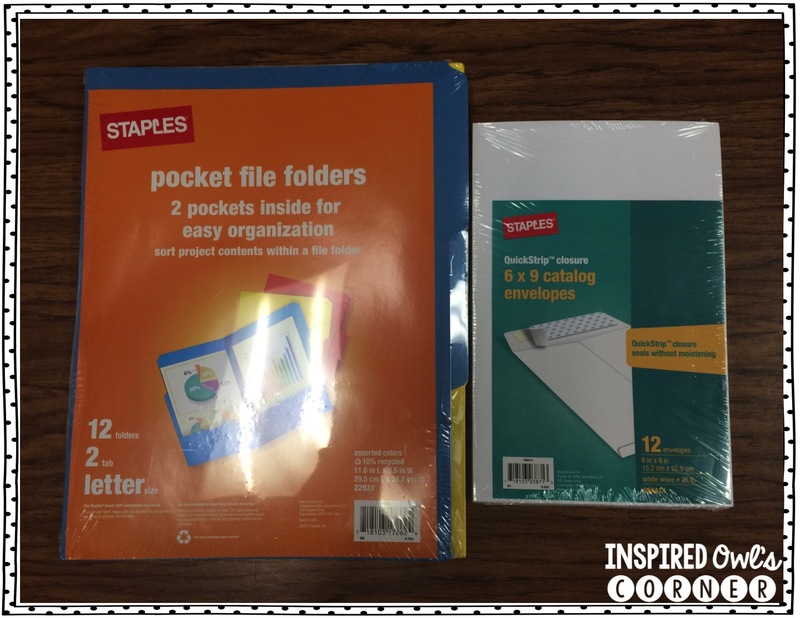 I buy the file folders with pockets and 5x7 envelopes from Staples to store my files. The pockets are great for storing everything. I have tried folders without the pockets and paper clips, but the contents easily fell out. 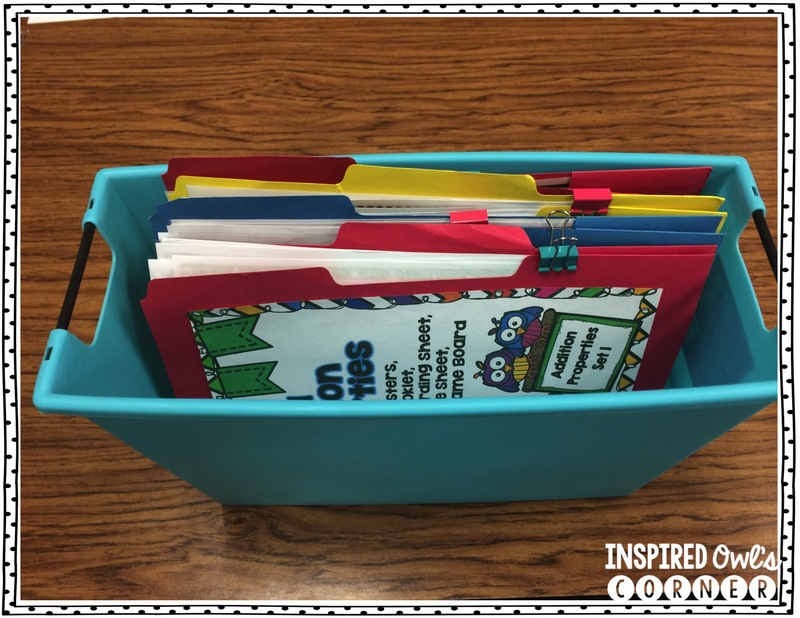 With these folders with pockets, everything for the center is contained in the file folder- this is so easy to store and organize! I keep the cards in the envelope so they don't end up with the wrong center. I print a copy of the cover for the center on the front to easily find what I need. I store all of my center files in the magazine holders below. (I bought these at Big Lots last summer.) These are labeled by season and sit on my shelf so they are readily accessible. 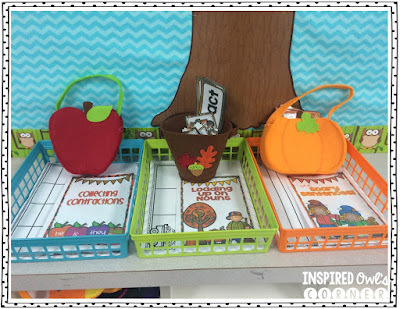 My kiddos go absolutely crazy if I add a cute themed felt bag or pail to my centers and work stations! 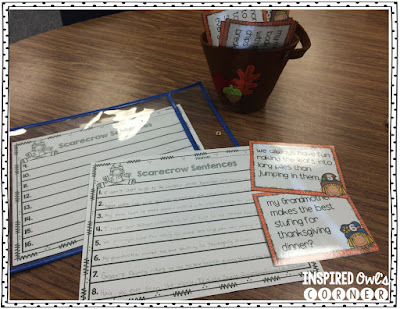 Sometimes I have them draw from the baskets, and other times I have them use the baskets to sort their cards, depending on the activity they are engaging in. 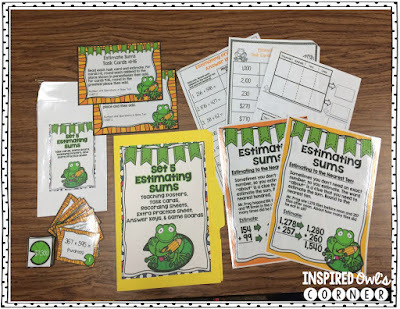 You can keep task cards in mini gift bags from the Dollar Store so students can grab them and go to their seats. I have found that adding this little bit of novelty helps to increase students' engagement and buy in. I oftentimes will sleeve the recording sheets in clear folders or page protectors to help conserve paper. I give the students a dry erase marker and a cloth, and students are ready to go. How do you organize your centers? Teacher Deals an Dollar Steals for November!